"To see beauty you must have beauty in your soul." The women of Naregeer village in Ethiopia's Upper Omo Valley are known for their lip plates and intricate scarification patterns on their skin. People photograph Africa in such a negative light, with wars, famine, and struggle but not for the beauty of African Tribes. Africa contains about one-quarter of the land of the world. This area is more than three times the size Europe or nearly as much as North and South America's combined. Rich savannas and one-half by fields, forests, cover One-fifth of Africa and fertile soil yet discovered. Her variety and profusion of people, tribes, and beauty are without a rival, and her output of beauty and despair is unparalleled in the history of the world. The Surma Tribes unique beauty and culture may soon vanish because of the Gibe III dam and the El Niño-induced drought. The hydroelectric dam, Gibe III was built on Ethiopia's Lower Omo Valley forcing the tribes from their homelands, traditions, and way of life. Nyangatom herder’s life is already tough; now with the Gibe III Dam holding back the Omo River’s water for grass for livestock grazing and farming has severely reduced water downstream for tribal communities, spreading hunger in the Omo Valley. In Ethiopia, where about 4 out of 5 people depend on agriculture for their livelihood, the effects of the El Niño-induced drought in 2015 and 2016 were devastating. Between 50 percent and 90 percent of crop production was failed. Particularly in 2016, rains failed in southern and southeastern Ethiopia were households are entirely dependent on livestock for their food and income. Ethiopia is also host to one of the largest refugee populations in Africa. March and April, gu and genna rains spring rains represent the main source of rainfall in the most affected regions in Ethiopia by the current drought, however, in 2017, the rains are below normal in amount and temperatures above-average. This would mean the third year of poor rainfall and the rains are unlikely to sufficiently regenerate pasture and water points critically needed for affected pastoral and agropastoral households to recover. 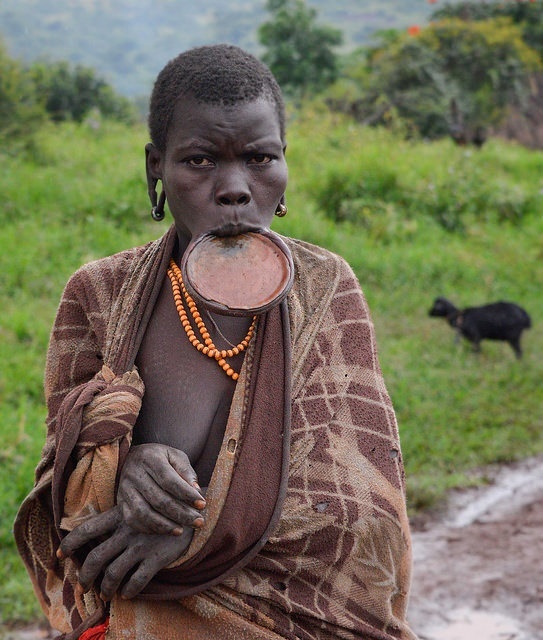 Your challenge is to share this photo of the lip plate elder from the vanishing Surma African Tribe and comment on her and the beauty of Africa. Also, encourage your friends and family to take the challenge and see for themselves the beauty of African Tribes. Photos credit to Rod Waddington who is a creative artist from Australia who has worked in sculpture, furniture, and photography. As a travel photographer, he has visited 64 different countries, photographing culture, food, and landscape. "What you see in yourself is what you see in the world."